I’m back with a third installment of the ultimate X-Men omnibus mapping, finding a way to squeeze just about every issue of X-titles into a cohesive bookshelf of handy omnibus volumes. Okay, they’re not actually all that handy. Most of them could probably be wielded as a deadly weapon. Today’s era begins with Grant Morrison’s run on New X-Men starting on #114 in 2001 and ends with the final issue of Joss Whedon’s Astonishing X-Men, which is the last thing that happens to any X-Men prior to Messiah Complex. Of course, there are a lot of other series contained in that material – you’ll immediately note that neither of those historic runs address a single issue of Uncanny X-Men! Every one of those issues is covered in this post. Why? To give you ideas for the The Most Wanted Marvel Omnibus Secret Ballot, where you vote for the comic runs you’d most like to see in an oversized format. Monday I covered all of X-Men from 1963 to 1991, and yesterday I covered 1991 to 2001. There are 25 potential omnibus volumes in this material! Many of their contents are high debatable, but that’s part of the fun – collected edition mapping is a contentious pastime. Heck, I don’t even agree with how Marvel does things half of the time! If you have a correction or disagreement don’t hold back – sound off in the comments below. Now, prepare to be fully educated in the seedy underbelly of this period of all-star X-Men writers, including some books I am sure you never knew existed unless you are a superfreak of a walking Encyclopedia-X like I am. Comic Book Review: X-Men Gold (2017) #1 by Guggenheim, Syaf, Leisten, Martin, & Petit – The X-Men Are Good (Guys) Again! That’s part of why everyone loves a sudden success story, whether that’s an indie movie or a hot new start-up. It’s not just the success we’re celebrating, but the subversion of trends and predictability. When you swim in the data of a thing all the time, it’s really hard to be pleasantly surprised by those fresh starts. I looked at the return order probability of hundreds of start-ups. There was no novel return curve to discover. After the first few dozen, everyone snapped into a story I had seen before. Comics can feel like that, too. It’s a tiny industry where the most read book never even approaches a million eyeballs (and I’m counting individual eyeballs here, not pairs). Marvel and DC are creating most of their stories with characters who have been around for over 25 years. Most of them have been combined into the same teams before. Most of the writers and artists are part of a crowd that flip flops back and forth, with stops at Image or another indie to take a breather. Most of the world-changing stories just echo back and forth between the big two publishers, copies of copies of copies of big ideas that have already been had. …and then we want more and more of that novel thing, until it’s our new past and becomes our next prologue. When Marvel or DC say they are launching something “new,” it’s with the caveat that a seasoned reader already knows the introduction to this story. The question is: does that mean you can predict where it will wind up? Written by Marc Guggenheim with pencils by Ardian Syaf, inks by Jay Leisten, colors by Frank Martin, and letters by VC’s Cory Petit. CK Says: Buy it! Bottom Line: Guggenheim’s new take on flagship X-Men feels familiar and maybe a bit fan-service-y, but that doesn’t stop it from being remarkably fresh as it achieves its back-to-basics aim: the X-Men feel like heroes again. Marc Guggenheim takes his second swing at the X-Men in three years, and this one is a solid hit. X-Men Gold is a delightful first issue with hints of many past teams, but it has a fresh outlook that’s intent on minimizing the recent past as leaden prologue weighing the series down from the start. The X-Men’s past being prologue isn’t something you’ll often hear me lament, as a studied X-fan of over 25 years. I’m all for continuity-dense mining of years of history, but Guggenheim -the successful creator of CW’s Arrow – was wise enough to know now isn’t the time. 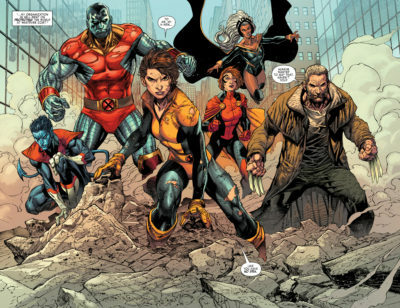 The X-Men are back to being a team who scrambles the Blackwing because they hear someone is in trouble – mutant or not. Or, at least, that’s what newly-minted leader Kitty Pryde wants them to be, which is how we wind up in medias res with the team facing down Terrax, whose previous X-book exposure comes solely from Dazzler. Why are they fighting him? Because The Avengers and The Champions didn’t show up and the X-Men are heroes. 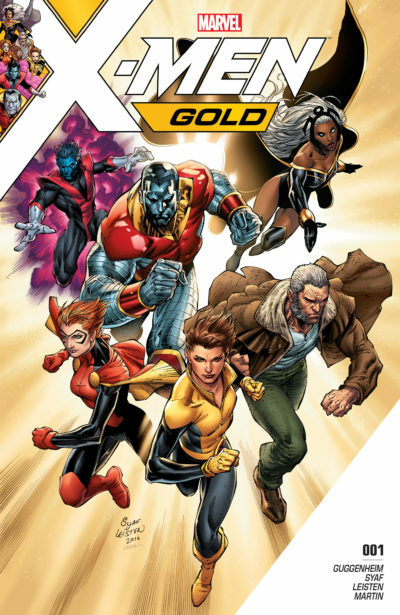 [Read more…] about Comic Book Review: X-Men Gold (2017) #1 by Guggenheim, Syaf, Leisten, Martin, & Petit – The X-Men Are Good (Guys) Again! Comic Book Review: X-Men Prime (2017) #1 – Marvel relaunches the X-Men with Kitty Pryde in charge! 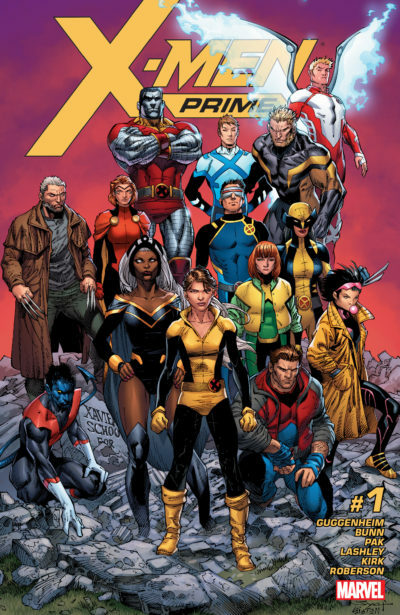 Yesterday, Marvel kicked off the relaunch of it’s entire X-Men line of comics with X-Men Prime, a one-shot meant to reset the status quo of Marvel’s mutants in the wake of Inhumans vs. X-Men. This issue represents the first time in many years that I can approach the X-Men as anything resembling a “new” reader. That’s because I’ve barely read a single issue of X-Men in Marvel’s All-New, All-Different era following Secret Wars. I usually trade-wait before reading, and in the middle of trade-waiting I was distracted from my Marvel reading by DC Rebirth and my WildStorm read. What is X-Men Prime? Is it any good? Will it lead to me reviewing X-Men comics every week from now on? Written by Marc Guggenheim, Greg Pak, and Cullen Bunn with line art from Ken Lashley, Ibraim Roberson, Leonard Kirk, and Guillermo Ortego and color art by Morry Hollowell, Frank D’Armata, and Michael Garland. Bottom Line: This “Kitty Pryde: This Is Your Life” issue is an easily skippable recap, more about her as a character than about the last two years of x-comics. It would be a fine free comic, but offers little entertainment for a steep $4.99 cover price. X-Men Prime is an insubstantial read that still manages to make a major change in the X-Men’s status quo. That comes along with a choice that may or may not work out in the end. Now, let me be clear – Kitty Pryde is never disappointing to me. She is one of my favorite characters in all of comics! That’s in part because Kitty Pryde is the eternal point-of-view character. That’s been true from her beginnings as the X-Men’s teen sidekick through her years in Excalibur and her return as an outsider first to Joss Whedon’s Astonishing X-Men and then to Matt Fraction’s run on Uncanny X-Men. Even when Kitty is the heart of a given team, she’s also the rational, grounded character who speaks with the voice of the reader. That’s why it’s fascinating to see her step in to lead dozens of characters we’ve grown to love over the past half century. Can she remain our POV-character when she’s the one in charge of all of the X-Men’s comings and goings? Can she even credibly take charge of characters like Storm, Colossus, Nightcrawler, Iceman, Magik, and more? This issue does little to explore that reality. It’s more of a “Kitty Pryde, this is your life” walkthrough that focuses more on her relationships than her (or the reader) catching up on the X-Men’s recent history. It also includes minor scenes of the original X-Men and Lady Deathstrike (more on those below). The strategy of the main story, scripted by incoming X-Men Gold writer Marc Guggenheim, seems to be that Kitty’s emotional ties to the team are more important than detailing anything that’s happened in the past five or ten years, or giving any hint of what’s to come. Aside from the sparest of recaps of Inhumans vs. X-Men by Storm and an explanation of the unlikely location of the X-mansion, there’s honestly very substance little to this main story. Despite the lack of content, the story still managed to be an emotional moment for me because it features Ken Lashley as the primary artist on a core X-Men title drawing Kitty Pryde. Lashley was one of my favorite 90s artists on Warren Ellis’s run of Excalibur, my favorite comics title of all time. He still makes for appointment reading whenever he shows up on a current comic. So far he’s not announced for any of the upcoming X-titles, but I have my fingers crossed that he will be the alternating arc artist on the bi-monthly Gold title. and he will be one of the alternating artists on Gold. Kitty’s words mirror the complaint of many major fans of the X-Men who have been disappointed with their recent status quo. We just want the X-Men to be heroes. Still mutants first, but heroes second before they are an endangered species. [Read more…] about Comic Book Review: X-Men Prime (2017) #1 – Marvel relaunches the X-Men with Kitty Pryde in charge! Riri Williams as Iron Man is a very good thing. We do not have enough female heroes or heroes of color, and to see a that in a character who is both as she takes over the mantle of ostensibly Marvel’s most popular single hero outside of Spider-Man is a huge, visible step not only for Marvel comic readers, but for their film fans who this news will surely reach. To have Williams also be a female super-scientist when Marvel generally boasts only a handful is even more wonderful. (The most prominent female geniuses of Marvel are Kitty Pryde, who is frequently shown to be nearly as genius as Beast; Valeria Richards, whose preternatural intelligence is partially attributed to super powers; the new Moon Girl; and Mockingbird, an oft-forgotten PhD) . 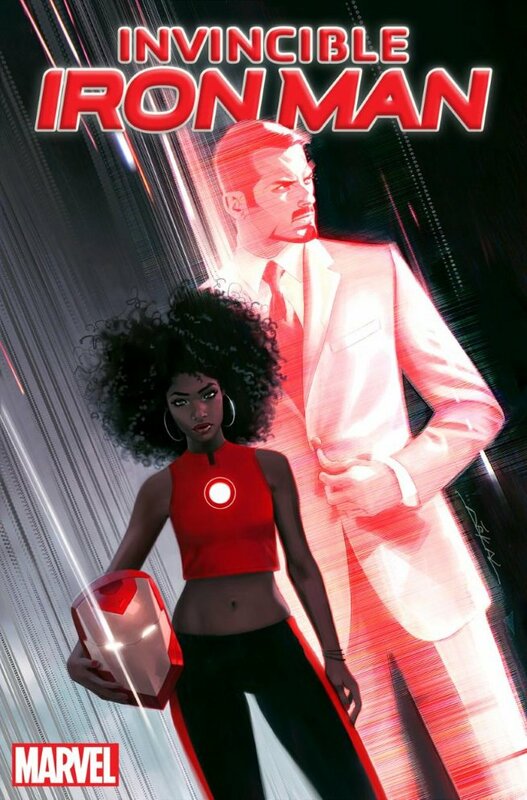 So Riri Williams as Iron Man is a good thing, right? On the face of it, yes. Inclusion means representation. I love reading books about heroes that are women, and so does my daughter – also a girl of color. 1. Minority legacy heroes are only useful until the original makes their return; then their marginalization can be worse than the average minority hero. “Legacy Heroes” is a term applied to heroes that are the replacement or junior version to their original heroes. They are sometimes used by creators as an opportunity to change the gender or race of the character bearing the main mantle.. The easiest examples to give are from DC comics (Superboy, Batgirl, Wondergirl, etc), because Marvel simply isn’t known for this practice outside the past few years. Let’s stick with Marvel, for the moment. For a brief time in the 1980s, Tony Stark could not serve as Iron Man and Rhodey Rhodes took over the title. Rhodey is the best possible example of a Legacy Hero – he was a dynamic, well-developed character long before he became Iron Man, and that means that he was able to continue to be featured even when Tony Stark returned. As War Machine, he’s lead his own title on many occasions (though they are usually short-lived) and he’s and been a significant character in both comics and now films (though he’s frequently sacrificed as a narrative reason to make Stark feel bad, as has happened twice this year alone). His time as a Legacy Hero made him more visible, but after being Iron Man he didn’t stay an A-level hero. The white guy bumped him. 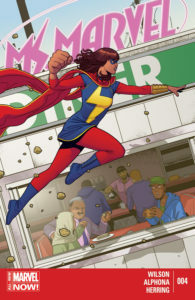 Another terrific example is the relatively new Ms. Marvel, the Pakastani-American Kamala Khan (visit the guide). Kamala is a wonderful analog to the original Spider-Man as a new, unsure hero, and Carol Danvers is very unlikely to ever retake her “Ms.” hero mantle now that she is officially Captain Marvel. Her books sell ridiculous amounts of copies and have been nominated for Eisners. She’s now an Avenger. Things are going well … but we’re only in year two. There are examples that don’t go as well. At the end of the comics version of the original Civil War, Captain America appears to die, and Bucky takes over the mantle as Cap (visit the guide). His days as Cap are amazing – great, layered storytelling. When Cap came back they shared the mantle for a while before Bucky was spun back to being Winter Soldier, at which point he began to sink back into obscurity – and he’s a white guy who stars in movies. As with War Machine, he’s now a character Marvel needs to periodically kickstart into a new title or team only to watch him sink again. Marvel’s Most-Wanted Omnibuses of 2016 – #2 and 1 Most-Wanted! We’ve arrived – it’s the finale of my annotated countdown of Marvel Most-Wanted Omnibuses, from the annual Secret Ballot officiated by TigerEyes. I covered #3-4 in the last installment. As you’ll see in a moment, the top two are a pair of books that hold special interest for me, so this will be a fun one! Before we get started, I want to thank everyone who has been tuning in daily to read these recaps – especially because you could have easily spoiled the anticipation by Googling to see the ballot results! For more details on all of Marvel’s existing omnibuses, visit my Marvel Omnibus & Oversized Hardcover Guide. It’s the most comprehensive tool on the web for details on every oversize book, including a rundown of contents and if the volume is still readily available for purchase. I’m always working to add more and more-updated information. Okay. This is it. The final pair of most-wanted omnibuses. Are you ready? [Read more…] about Marvel’s Most-Wanted Omnibuses of 2016 – #2 and 1 Most-Wanted!